Group messaging has been something that has been pretty hot for a while now. In fact, it’s gotten so hot that products from other hot spaces are starting to pivot towards it — see: Brightkite. But despite the hotness, I’ve yet to find one of these apps that really hooks me. But a new entry in the space, Beluga, may just be my elusive white whale. As first covered yesterday by blogger Louis Gray, Beluga is a service with a good pedigree. The three people behind it, Lucy Zhang, Ben Davenport, and Jon Perlow, are all Xooglers (ex-Googlers). 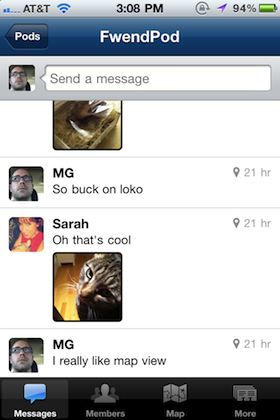 What they’ve built is a simple, elegant, and fast group messaging service. The key may be that it works across several different platforms: iPhone, Android, mobile web, regular web, and text message. But whereas most group messaging apps seem to focus on the lowest common denominator, SMS, Beluga puts the focus on the native iPhone and Android apps. The rest are simply fallback options. And across all the platforms, they’ve able to keep the experience consistent. “Our initial motivation was wanting to eliminate the pain of coordinating plans among groups of people on the move. We wanted to communicate with groups of our actual friends in real-time (and in private) from our phones,” Davenport tells us. “We didn’t feel any existing solution really gave us what we wanted, and when we got positive feedback on our idea from talking to friends, we set out to create the best possible app for small private group communication,” he continues. And based on my usage of the app over the past couple of days, I think they’ve come pretty close to nailing it. 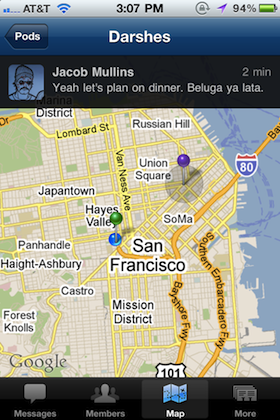 What strikes me is how Beluga seems to fullfil the promise of what Facebook Messages is supposed to be. Again, quick messages in real-time across platforms. I really like Facebook Messages so far on the web (so much so that I hope Gmail copies it), but the mobile experience leaves much to be desired so far. Beluga nails the mobile execution. It’s almost as if Beluga is like Facebook Messages plus Groups. Groups on Facebook’s iPhone app almost accomplishes this. But it’s too heavy. There are too many layers. You can post messages and comments and you can like things. Beluga is just messages. And Facebook’s mobile clients don’t have a good notification system for Groups. Beluga is all about notifications. The other popular group messaging services are either too text-reliant or too complicated for my tastes. TextPlus is probably the best-known of this group. But when I load it up I see 30 things I could do, some of which are free and some of which cost additional money. I never know what to click so I end up clicking one button: the iPhone home button to exit the app. But Beluga offers up a few others things as well that the others don’t that I love. First, you have the option to tag each message with your location. Each “Pod” (the groups Beluga creates for your different conversations) has a “Map” view which allows you to see where everyone in the group is sending their messages from. This can be helpful if you’re trying to find one another — or just cool if you’re chatting from different parts of the world. You can also set a time and location for each Pod. This can be changed on the fly by anyone in the Pod so you can keep using the Pod to coordinate different events. To invite friends to chat in Pods, you can either use an email address or phone number (or name if they already have an account). “We want creating a group conversation to be as easy as sending an email or a text message, but to be a better experience than either. Immediacy and performance are key, so we are primarily focused on native mobile apps (using push notifications),” Davenport says. He notes that initially it was just himself and Zhang working on the app in New York City this past July. That’s when they first tested a prototype on a 12-person group trip. A further 45-person test followed in September. After that, they brought on Perlow as a third co-founder and CTO. By November, they relocated the operation to Palo Alto, and started sharing space with Quora. Davenport says that they’re currently actively working on the iPhone, Android, and mobile web versions of the app, but they’re considering BlackBerry and the other mobile OSes as well. They’ve also recently launched their SMS integration through Twilio. Beluga tapped Braden Kowitz at Google Ventures to do a UX refresh recently, Davenport says. And the work shows. But they’re still just a team of three for now, though they plan to hire shortly as they look into taking on some funding (the operation is currently self-funded). So why the name Beluga? Looking at the icon, you might think it’s an homage to Twitter’s Fail Whale. 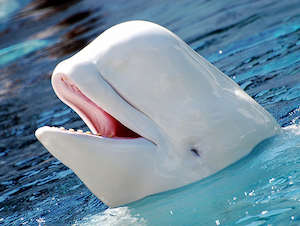 But actually, “Beluga whales are smart, mobile and social — just like our apps. They’re also cute,” Davenport says.